where shall I go for the song? nor the power to truly sting. a line or two might chance to shine. How should she desert us now? yet she sings, she sings! to legends of the dead. become the King of Hearts. the rest you may ignore. ...Fun was always at the heart of the matter with Jerry, and now, three weeks and a thousand universes later, the notion that my world, and the world of countless others, will be decidedly less fun is painfully setting in. Of course, Jerry desperately wouldn't want me or us to feel this way. I'm certain of that. Every fiber of his being was dedicated to the awesome task of making us all feel better, and he always did. He had those special unique qualities that fused his great creativity with his even greater humanity, tempered always with that sense of humor...fun. Let's not confuse the issue, though. Jerome Garcia was a great leader: musically, morally, and spiritually. He didn't want it, he didn't seek it, he didn't ask for it, he may not have even liked it, but he carried that enormous weight with grace, dignity, and a huge sense of responsibility to his fellow man, particularly those less fortunate. If you needed help, he was there. Of course, as we now know, it was Jerry himself who needed help. Although he was getting it, the years had already taken their toll, and that long, strange trip is over. But is it really? Not for us: Jerry's kids. We need to take his message to heart, find our own creativity and our own path, and help try and make this world a little better, which will be just a little harder for us now. This is our challenge, which I feel we can meet if we can all take a little piece of him with us. We all need to become a little more Jerry-like and move on down the road. Just one more thing I thought you'd want to know - Jerry died with a smile on his face. 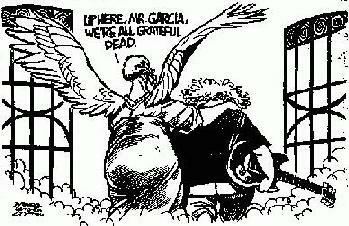 "To honor the Grateful Dead's wishes, I'd like to have a moment - a moment of silence - for somebody who brought a lot of love to the world, our dear departed brother, Jerry Garcia." At the Rock and Roll Hall of Fame I dedicated my perfomance to Jerry. It was hard to do, but I was so excited. 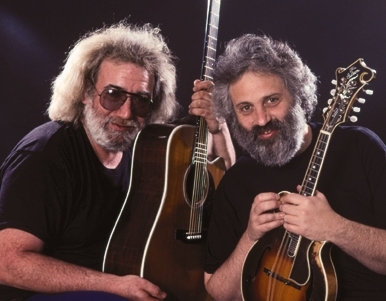 It was a sad reason that I played, but Jerry was someone really special, and I was honored that the Grateful Dead wanted me to do this. In September 1990, I came into the Dead just winging it off the streets for five nights at Madison Square Garden. There's nothing like the Grateful Dead audience, and it was incredible for me to bite off a small piece of that. I always felt a certain connection with Garcia. At RFK, during the second night, the next to last song, Wharf Rat, there was a blue light on him. He was singing very soulfully, and I was getting chills up my body. I knew it was a special moment, and I drank it in.